We are thrilled to partner with FoodCorps Des Moines in our screening of FedUp at the Fleur Cinema on January 26th. Proceeds from tickets sales will go to support this organization. Learn more here or find details below. What is FoodCorps? 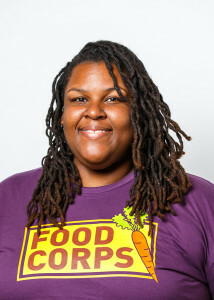 It’s a nationwide team of AmeriCorps leaders who connect kids to real food and help them grow up healthy. Meet Chelsea Krist, Amy Joens, and Jenetta Hargrove of FoodCorps Des Moines. Together with Des Moines Public Schools, FoodCorps helps students, educators, and community members in all kinds of ways – from pulling weeds in school gardens to cooking giant batches of applesauce. Read on to discover how Chelsea, Amy, and Jenetta bring food and nutrition education into the lives of our central Iowa youth with Foodcorps Des Moines. What is FoodCorps Des Moines and why is it important? Chelsea: FoodCorps Des Moines is one of our 6 service sites across Iowa. We work in several elementary schools throughout Des Moines by planting gardens, teaching nutrition lessons, and leading cooking classes. Not only are we engaging with students, we are organizing these efforts with the communities and neighborhoods surrounding the schools, including parents, teachers, neighborhood associations, local organizations, the school district and the city to work together to create change that has staying power. At the heart of our role, we work to empower students and broader school communities to acknowledge and address issues of inequity in the food system, inequities that disproportionately affect communities of color and low-resource communities. FoodCorps service members in Des Moines, and across the country, hold the passion, patience and space to spur conversations and share powerful stories about the important role of food in broader social justice issues. What projects have you launched in Des Moines? Chelsea: Over the course of our 5-year partnership with DMPS, FoodCorps Des Moines has supported the founding of several school garden programs. This year, Des Moines’ service members are partnered with 6 elementary schools: Carver, Moulton, King, Hillis, Findley, and Monroe. Each of these schools has an on-site garden that serves the school community in unique ways. Some gardens are currently being developed while others have been a fixture of the school for years. 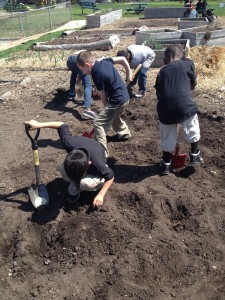 Amy: Several schools have weekly student garden clubs that meet after school. Students can choose to be in garden club and do different activities related to gardening (or cooking in the winter time), including weed-pulling and washing dishes! The Boys and Girls Club at Carver Elementary rotates all of their students through Little Sprouts (cooking and gardening club) to expose even more students to preparing healthy foods and growing gardens. At Moulton Elementary, we did a school-wide composting unit where each grade learned about composting and food waste in a way that connected to their curriculum. These lessons culminated in a food waste sort during lunchtime, where 4th graders led each grade in separating the trash, compost, and recycling from their lunch tray, eventually taking the food scraps collected to the garden’s compost pile. We got to spread that compost over the garden in the spring! Chelsea: We also engage students in the process of food production, like harvesting the garden produce, working with the food service workers to prepare the foods, serving the foods at lunchtime, marketing/educating other students about the foods, and collecting feedback from students about their taste preferences. 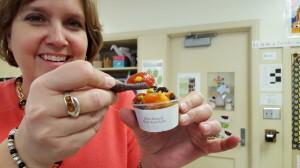 We lead cafeteria taste tests with school garden produce and/or other local foods. Sometimes, students get to try new recipes with local or garden products that the school district may put on the lunch menu. Jenetta: At Hillis Elementary we have a weekly, hour-long, health, nutrition, and ecology lesson, called ECO hour. During Eco Hour, students learn where their food comes from, how to be better stewards of the environment, how to get their bodies moving, new healthy recipes, and how to prepare those recipes. We also run a school-wide “Pick a Better Snack” lesson where fifth graders take on the role of “Healthy Snack Ambassadors” and teach each of the lower grades about a new fruit or vegetable and where they can find it. Tell us how the children respond to the gardens. Chelsea: We’ve found that children are curious, creative and eager to try new things. They love to be in the garden, even if they are initially afraid of getting dirty or being near bugs. They love to chop, boil, stir, and grate things. And overwhelmingly, with a little convincing or with none, they will try new things. Jenetta: Gardening with kids constantly challenges what I thought I knew! I was working in the garden on a very brisk day while the kids were having recess. I was absolutely sure they would have no interest in working in the garden and getting dirty on such a cold day but one third grader came over and told me he had learned about putting the garden to bed last year and wanted to know if he could help, and before I knew it, I had 40 kids pulling up plants, weeding, and filling up the compost. They love hanging out in the garden. 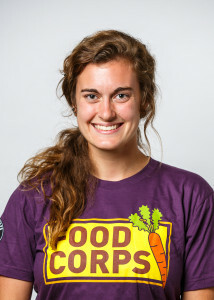 Check out our FoodCorps IA blog! What are some of your cooking initiatives? Amy: Many of the gardening clubs I lead turn into cooking clubs during the winter months. We try all sorts of fruits and vegetables. We’ll try familiar recipes. We’ll try wacky, strange, new recipes. We’ll make art with our food. We’ll try recipes from all sorts of different cultures. 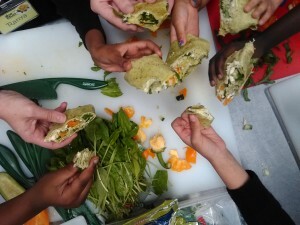 We cook with food from our school gardens. Across the board, kids are lining up to take these classes and be a part of these clubs. They LOVE the ability to be in the kitchen, create delicious food with their own hands, and share it with others. It is beautiful to see the empowerment they feel after learning some cooking basics: they are more apt to respectfully try new foods, help with cooking at home, and show a genuine interest in where their food is coming from. 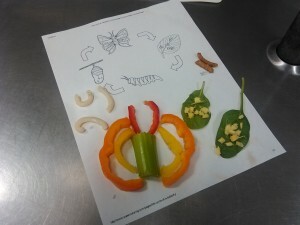 The After School Arts Program has been an incredibly fun partnership for FoodCorps Des Moines, and kids that have gone through the program have learned an incredible amount. During our banquet the last session, in front of one hundred people, one of my students was sharing some things about the program. She said, “I want to thank our teacher for all the things we learned in cooking class. 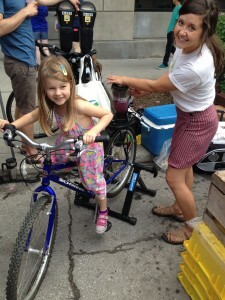 She even taught us that we could make cupcakes out of beets, and that was…. Surprising.” Some of these students, like Lane, (a fifth-grader), have even graduated from our Culinary Arts class and become a “student-teacher.” Lane led a cooking class for other students (from toddlers to high schoolers!) during the Summer Sustainability Series at the Forest Avenue Outreach garden. Chelsea: At a district level, service members partner with DMPS’ Food Service Director and District Chef to plan and locally sourced food items for different celebrations throughout the year, including National Farm to School Month (October), National School Lunch Week, and National School Breakfast Week. This year, the district hosted the second annual Midwest Menu – a school lunch consisting of local apples and local corn (from Iowa Choice Harvest), regionally grown chicken, and a homemade whole-wheat roll. Delicious! 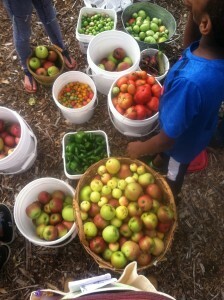 30,000+ students is a lot of mouths to feed – and a lot of local food to source! Finding creative, cost-effective connections between the district and local farms and food hubs is no small feat, and it is to the credit of hard working staff members who are passionate about healthy kids that makes this all come together. We are excited to see this interest growing across the district. And how do they respond when you encourage them to eat vegetables? 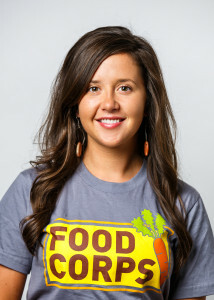 Amy: People often think that getting kids to eat vegetables must be the hardest part of our job. But, when kids have experiences with their food and begin to build a relationship with it, it is no challenge to have them eat it. Seaweed, edible flowers, raw cranberries, and green soup have all been on our menus. Jenetta: I like to keep it simple. If you can get a kid outside to grow food in a school garden, and then get them back inside to prepare it, they will most likely eat it. Surprisingly and lucky for us, it’s not that hard to do either one of those things. Kids want to be in gardens and they want to cook. Every time I mention to students that we’re eating something they grew right here at their school, they beam. They just need our presence and support. Who are your partners, both locally and nationally, and how do you receive your funding? Chelsea: On a statewide level, FoodCorps IA is hosted by ISU Extension and Outreach: Local Foods Team. 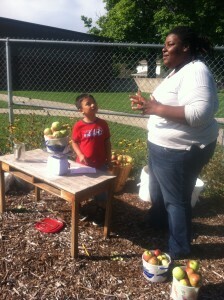 Locally, the FoodCorps team in Des Moines is hosted by Des Moines Public Schools. Both of these host organizations fund the local program, along with FoodCorps, as a national non-profit. Here is a link to a listing of the foundations, corporations, and service partners that support the national program. Local partnerships are essential for capacity building and extended community connections. We value ongoing partnerships with Master Gardeners, CFUM (Children and Family Urban Movement), Boys and Girls Club, ASAP (After School Arts Program), Urban Ambassadors, PTA groups, IA Department of Public Health, local Americorps teams, Iowa Choice Harvest, Grade A Gardens, Forest Avenue Outreach, neighborhood associations, United Way, Agricultural Urbanism Toolkit, Keep Iowa Beautiful, Team Nutrition, YMCA, Starfish Academy, Creative Visions, Lutheran Hospitals, People for Pollinators, Viva East Bank, Farm Table Delivery, Community Youth Concepts, Eat Greater Des Moines, IA Farm to School, Hy-Vee, and more. How can people support FoodCorps Des Moines? 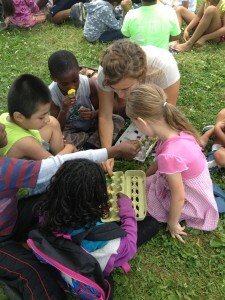 Chelsea: Teacher, staff, parent and community engagement go a long way to creating thriving school gardens. With this, FoodCorps hosts a local school garden listserv, an online community that creates a space for sharing resources, grant opportunities, challenges and success stories, and connections to other garden programs. Interested individuals can sign up for the listserv by emailing amy.joens@foodcorps.org. Amy: We often are looking for volunteers! During spring planting days, large cooking endeavors, garden clean-ups, and special events, we need extra hands. Connect with us if that is an interest of yours! Also, support schools in your communities. Maybe they already have a garden and could use some support during the summer months with watering, weeding, and other maintenance. Maybe they need guest teachers. Ask them how you can help them to help kids grow up healthy! Join us for a Night at the Movies and Support FoodCorps Des Moines! You can help support this great organization by attending our January 26th screening of FedUp at the Fleur Cinema. Ticket proceeds will go to benefit FoodCorps Des Moines, in partnership with Des Moines Public Schools. Join us for a night at the movies to support a health-minded local cause. This event has been endorsed by the Iowa Healthiest State Initiative.